Alexei Malakhov/Streeter FLAMES BREAK OUT from their own end en route to victory in a final game at De la Salle Arena, as part of the the LHA Select Invitational Tournament last weekend. Alexei Malakhov/StreeterANXIOUS MOMENTS: Parents watched the game intently at De La Salle Arena during the final games. It was their tournament in more than one way. Leaside teams emerged champions in many of the divisions of the Leaside Select Invitational Tournament over the past weekend, including three of the Midget Junior and Midget Senior divisions — all incidentally played at the De la Salle arena in Summerhill. Leaside Flames edged the Etobicoke-based Faustina Fury 5-4 in the Midget Junior Gold final, after placing second to Faustina in the tournament that ran from Jan. 31 to Feb. 3. 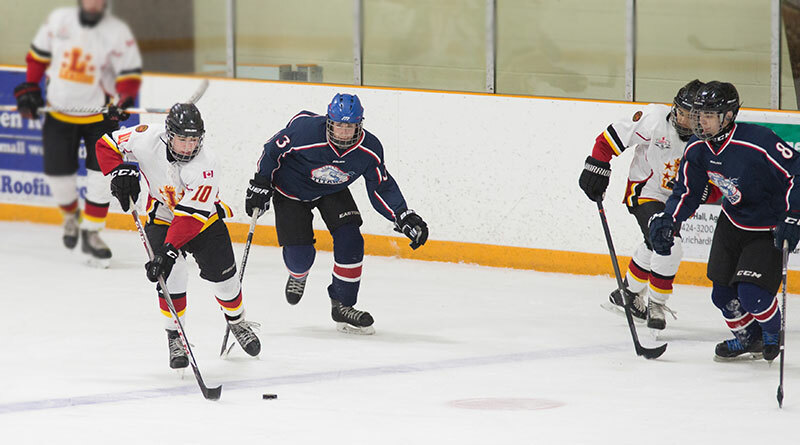 In the Midget Senior Red division, the Flames and and the George Bell Titans were virtually died in the weekend tournament, each with two wins, no losses and one tie (against each other). Leaside, however, dominated in the Sunday final. They got out to an impressive 3-0 lead which held until 10 minutes from the game’s end when George Bell finally scored. But the Flames notched another goal with two minutes left to beat the Titans 4-1 and win the tournament. Then in the Midget Senior Gold division, Leaside again placed second in the standings but beat the first-placed team, this time the Downsview-based Duffield Devils 3-2, in the final. Alexei Malakhov/StreeterFLAMES COACH Chris Connoly paces behind the Midget Senior Red bench. He needn’t have worried though — the team won the final 4-1. Leaside were also champs in the Novice Gold, Minor Atom Gold, Atom Red, Atom Gold, Minor Peewee Red, Minor Bantam Red, Minor Midget Red — taking the title in 10 of the tournament’s 28 divisions. The tournament featured 112 teams from across Ontario playing at eight midtown and north-end arenas in Toronto. Alexei Malakhov/StreeterAIR HOCKEY: A Leaside and George Bell player try to find a flying puck during tournament action on Feb. 3.